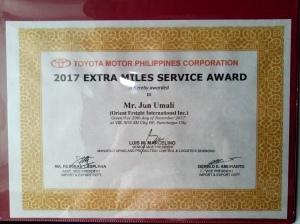 In the recent Toyota Motor Phils.’ Import and Export Division and Vehicle Logistics Division joint Christmas party for their Logistics Service Providers held last Wednesday November 29, 2017 at Vikings SM BF Paranaque, Orient Freight International, Inc. was once again recognized with the highest award given to all LSP’s serving Toyota Motors Phils. 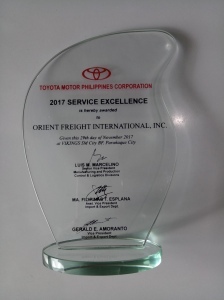 For the second consecutive year, Orient Freight was awarded with the SERVICE EXCELLENCE AWARD. 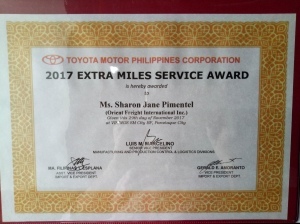 Aside from the top award, Orient Freight personnel also bagged individual awards such as “Extra Mile Service Award” given to Sharon Jane Pimentel, Roel Cueto, and Jun Umali. 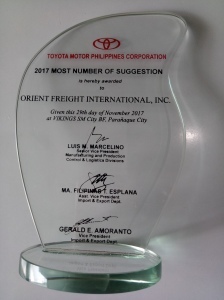 The “Best in Suggestion Award” was also given to Orient Freight International, Inc.
Aside from Toyota Motor Phils., present and also handing out their own awards was TMP’s subsidiary, Toyota (Motor Phils.) 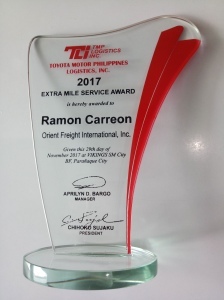 Logistics Inc. TLI awarded the “Extra Mile Service Award” to Ramon Carreon. TLI also bestowed the honor of being the “Broker of the Year” to Orient Freight International, Inc. 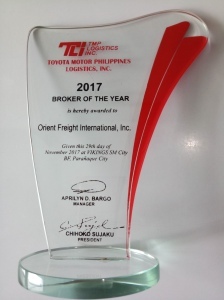 According to Mr. Erwin Fontanilla (Orient Freight’s Logistics Manager), these awards are testaments of Orient Freight’s commitment and dedication to all its clients, especially Toyota Motor Phils. 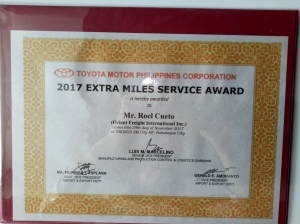 We greatly appreciate the honor and we will strive further to improve and hopefully recipients of same and more awards next year, possibly having the same honor and distinction as with our client, Toyota – as Triple Crown winners.